Power Electronics Design Handbook covers the basics of power electronics theory and components while emphasizing modern low-power components and applications. Coverage includes power semiconductors, converters, power supplies, batteries, protection systems, and power ICs. 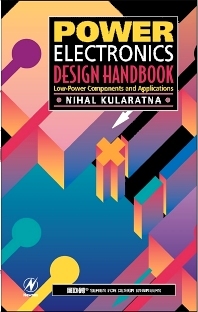 One of the unique features of the Power Electronics Design Handbook is the integration of component and system theory with practical applications, particularly energy-saving low-power applications. Many chapters also include a section that looks forward to future developments in that area. References for further information or more in-depth technical reading are also included. Nihal Kularatna is a principal research engineer with the Arthur C. Clarke Foundation in Sri Lanka. He is also the author of Modern Electronic Test and Measuring Instruments, published by the Institute of Electrical Engineers.